The weather is almost certainly the most common topic of conversation in the UK, probably because we have such a variety. I was in the Derbyshire Peaks on Boxing Day when we had 15 cm of wondrous white snow, yet a few days later in Weymouth I was walking along the seafront in a t-shirt with the sun shimmering on the sea. This range of weather has also brought us a wonderful variety of vocabulary, which just happens to be the subject of this newsletter. 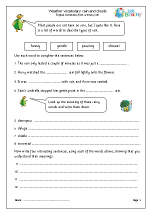 This week we have published three great sets of vocabulary pages on the weather, featuring sunshine, rain and wind. Words such as deluge, torrential and drizzle are found in the rain vocabulary pages as well as a fun selection of sayings such as, ‘It’s raining cats and dogs’ and ‘Under a cloud’. 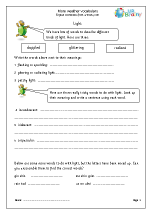 Children love being introduced to these sayings and are often bemused by them and it is well worth developing this interest by investigating their origins, as well as using them as the subjects of cartoons. Balmy, humid and sultry are just three of the words found on the Sunny Skies worksheet and breezy, blustery and squally are examples from the Windy section, which also includes a great page explaining the Beaufort Scale.